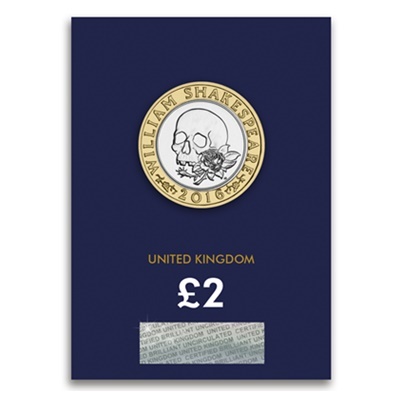 In 2016 the Royal Mint issued three specially commissioned £2 coins, commemorating the life and work of William Shakespeare. This is the first time a coin has been struck to commemorate this literary great, John Bergdahl’s fantastic designs bring Shakespeare’s world famous works to life. The reverse of this coin has been beautifully struck with a unique design paying tribute to Shakespeare’s tragedies. Struck by the Royal Mint to an unblemished Brilliant Uncirculated finish, this £2 coin has been protectively encapsulated and features a security hologram to certify its superior quality.